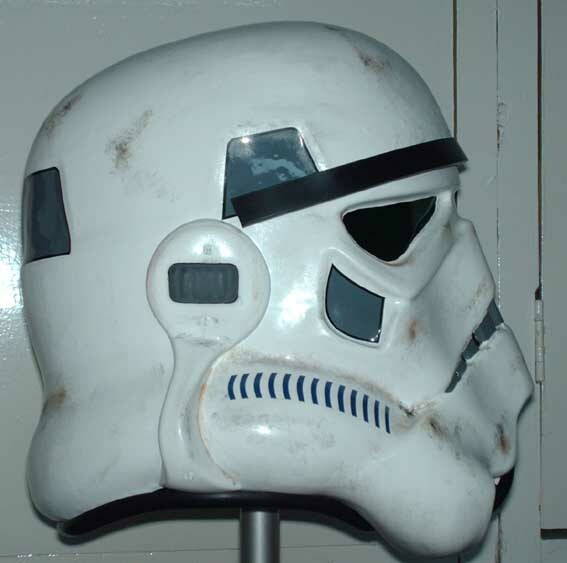 Updated 2008 - The TE2 Stormtrooper is best described as the new production of helmets and armour made by a new owner, using a set of "TE's" (aka "Anon") 2nd generation moulds taken from two original ANH Stunt helmet. If that sounds confusing its because it is! 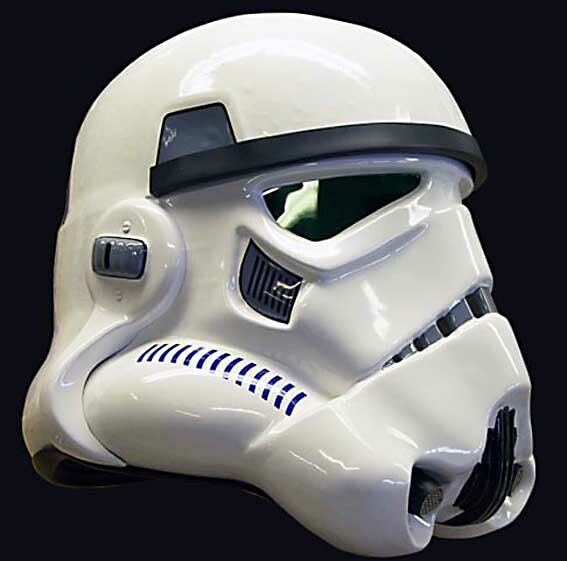 These new helmets (and armor) has impressed a great many people in the hobby with its quality and accuracy. 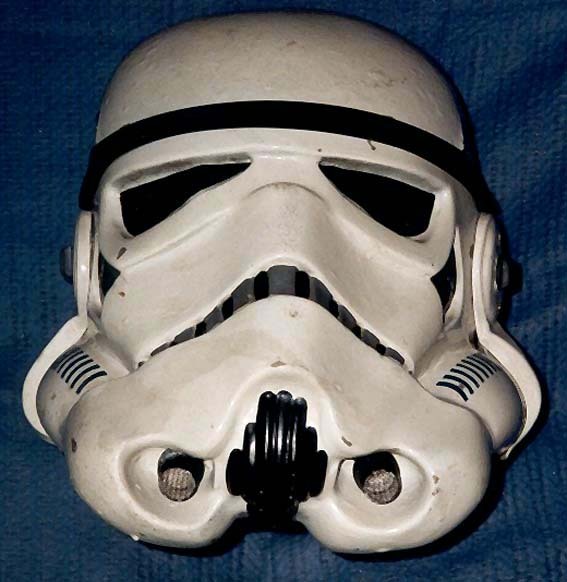 As its such a contentious issue, suffice to say that the moulds used to create this helmet, the Gino/CRProps, the GF and AP helmets have all derived form the same original Stunt helmet below - owned by Brian R (see more pics of this Brian's original helmet in the Real/ANH Stormtrooper section). Thanks to Mike(TK-4510) and Smitty for the pics, comparisons and Info. 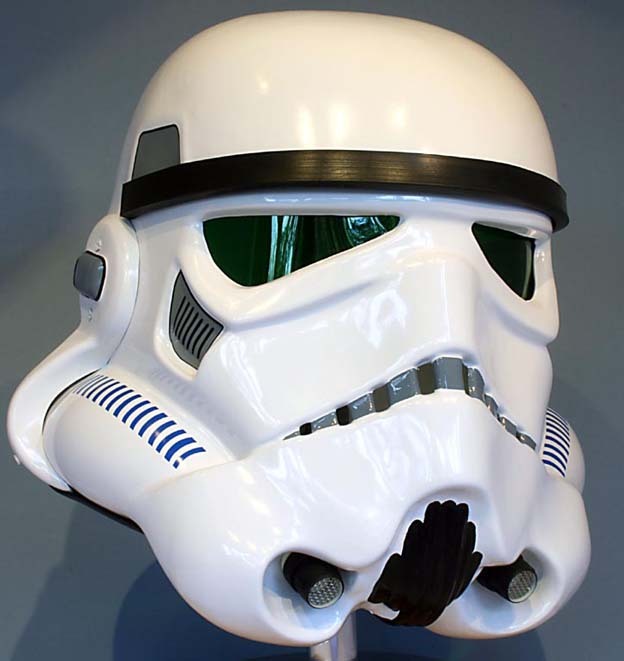 Its fabricated using .090 gauge High Impact PolyStyrene (HIPS) plastic. This styrene does not have a glossy finish to it so has to be sanded, primed and painted. However after this the finish is superb! 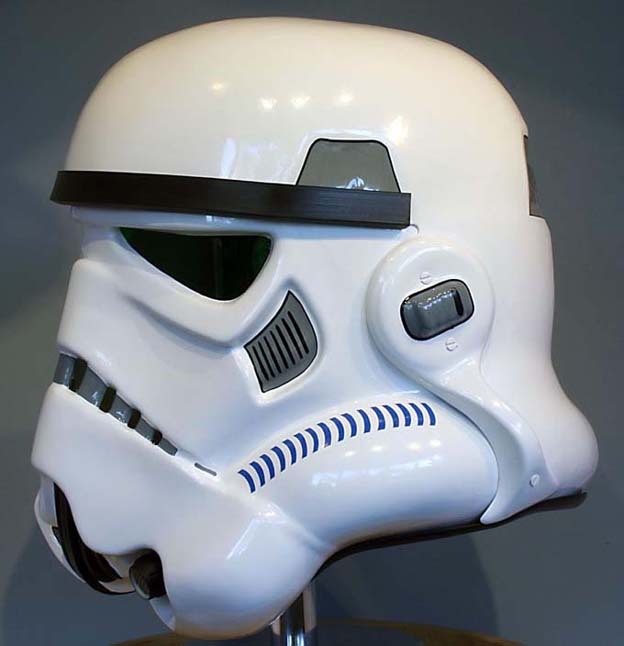 Its based on the same composition/parts as the other screen-accurate Stunt helmets, namely: Face plate, Bumpy cap & back piece, Ear pieces, Screen-accurate brow and neck trim (imported from the U.K.), all bolted together with the Green acetate lens material. The bumpy cap and back is a key point. 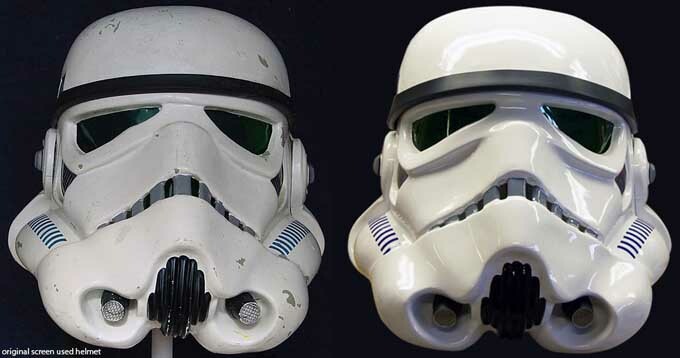 Many collectors like their replica helmets to be as close to the originals as possible, and as you can see the original Stunt helmets were NOT smooth and shiny. Hence the TE2 helmet has a bumpy appearance to the back and cap, just like the originals since the producer has not cleaned up the surface bumps on the moulds. Since its cast from an original (on the inside) there were numerous bumps caused by Andrew Ainsworth's vac-forming process on the originals. Above and below some new shots (Jan 2009) from Rolf of his weathered TE2 Helmet and armour - fabulous! I really love these shots as they really look like "location" shots of a trooper patrolling round the back streets of Mos Eisley. This rear shot shows how superb the ensemble is, most especially that back-pack. 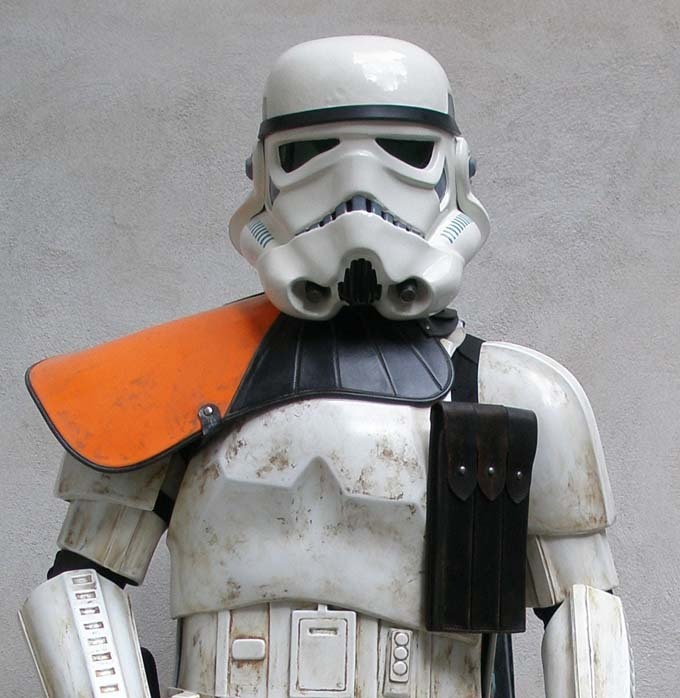 These next three shots (including the one above) are all from Rolf of his new TE2 armor (pre helmet weathering)- from his ever-expanding garrison of trooper armor. Rolf's accessories for this set are absolutely superb - as is the weathering and really compliment the TE2 armor giving that "just swept in from a Tatooine sandstorm" kind of finish. Thanks for the great pics Rolf! The next two are Smitty's TE2 helmet, which he used high quality decals and Keith's version of the "Hovi mix" mic tips. 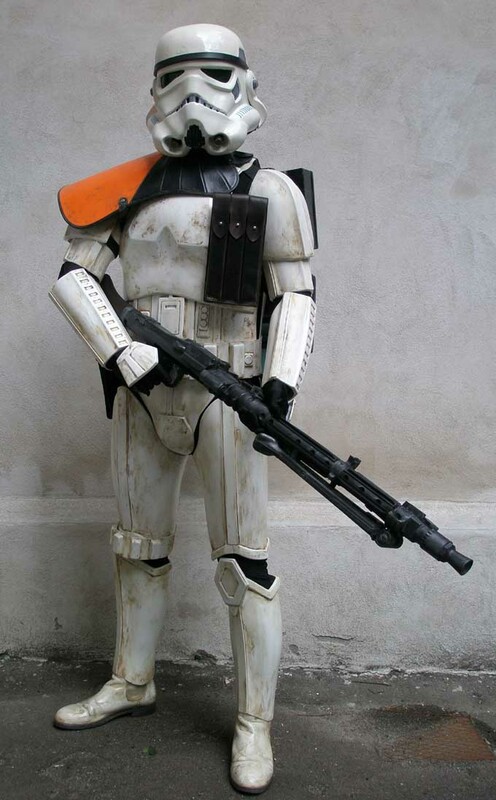 The use of HIPS plastic lends itself to sharper details on both helmet and body armor and the finish fully demonstrates this. Below some great comparisons of an original (known as "Dave M's") on the left and the TE2 on the right. 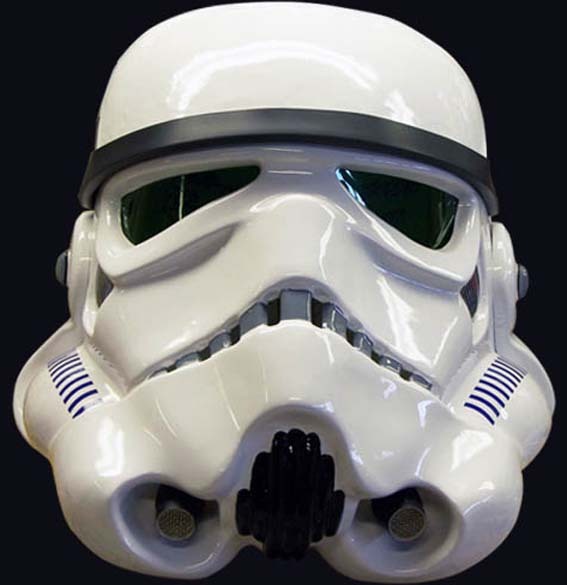 Note that this is not the actual helmet it came from (which was the Brian R seen higher up), although the ears did derive from it, to confuse things! 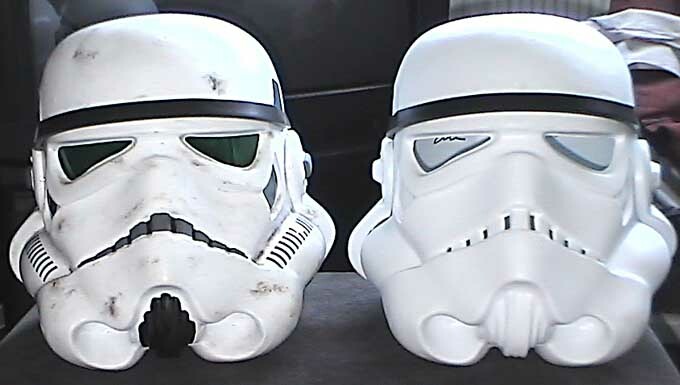 Also note that the helmets below are NOT actually sitting next to each other - its a Photoshop comparison, hence scale, lens, distance, focal length etc. are most probably different - but nevertheless its a good comparison. That's another great helmet - thanks to Mike and Smitty for their help. 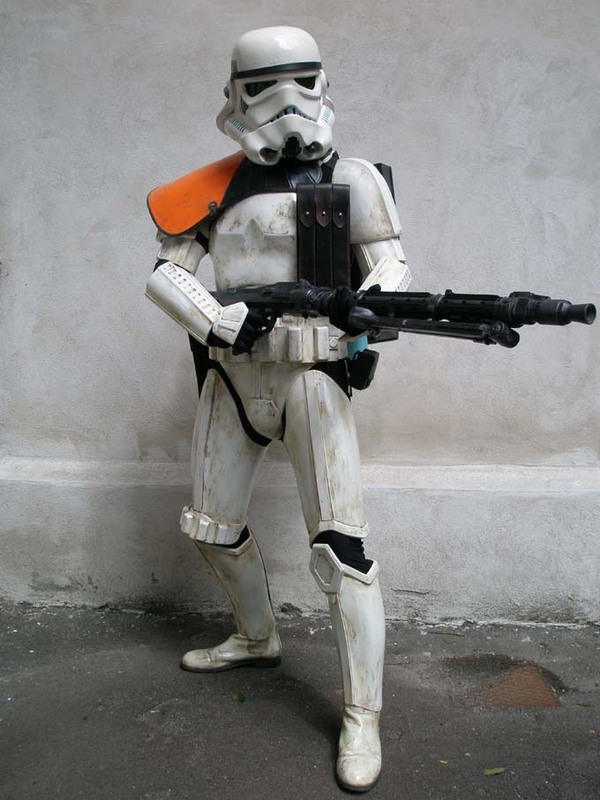 Below, some more shots of the TE2, this time from Andy, who's painted his up in Mos Eisley Sandtrooper style! Andy bought this helmet back in the summer together with another helmet direct from the TE2. 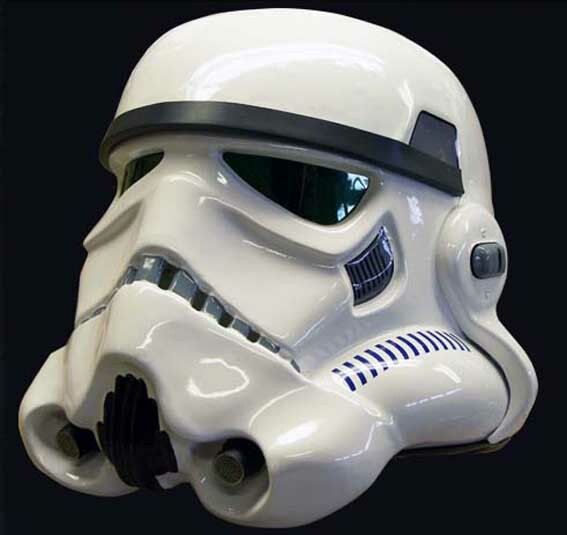 The helmets are made from a matt HIPS plastic and each helmet is signed and numbered by the maker on the inside, just behind the rear trapezoids. Also quoted on each helmet is a Biblical Scripture: Ephesians 6:10-18 ( the Armour of God) a nice touch I thought. 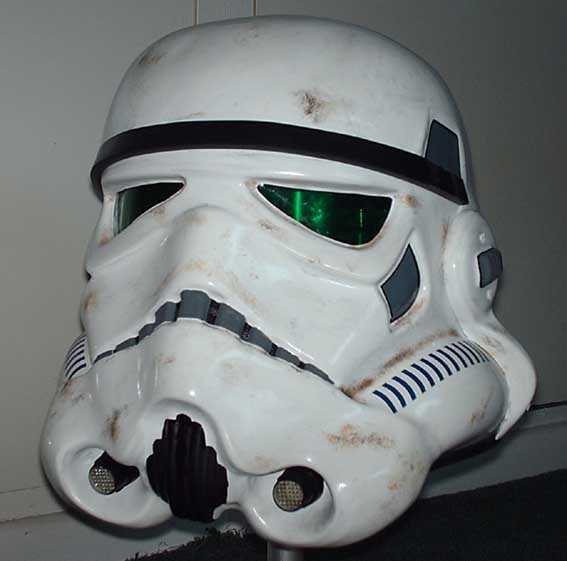 Below a pic of the Sandtrooper half finished next to a raw helmet as it arrived. Nice work Andy! The new decals are a fantastic copy of the Set for Stun helmet featured higher up the page. 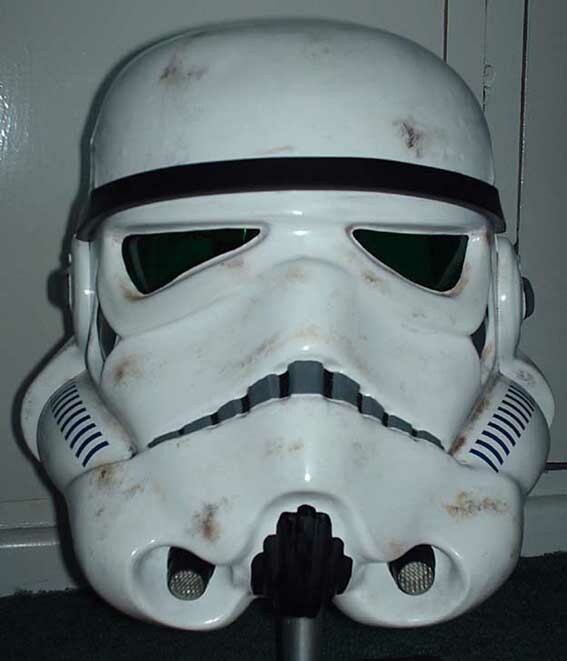 Its a really cool helmet and the bumpy cap, showing all the markings of the HDPE original it came from has given it a real "on set" used look about it. Well done guys. I'm assembling my armour now so will post more pics when its all done. Having not had armour for more than three years, its nice to have a set again! Finally a really useful photo from TK-2416 from Denmark showing the AP (with Black ESB frown), next to a TE2 in the middle and the cheap MR "CE" lid to the right. Really useful comparison.